I hosted a baby shower for my best friend who was having her 1st little boy. After I made the diaper cake that had construction site rubber ducks, I thought it would be cute to do a rubber duck shower. Everything was yellow, orange and white. We had yellow and white table clothes. The streamers where white with yellow ducks, and solid orange. 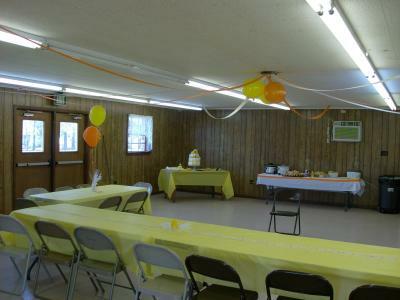 We also had yellow and orange balloons. After we played two games she opened all her wonderful gifts. Then we had a buffet of different foods including a yellow and orange cake, with a duck pond with a momma duck and her 3 babies. Her daughters (5 and 9) and I had a blast hosting this colorful shower. Note from the editor: Krista, this is so cute! I love that you included your friend's little girls in the baby shower planning with you! Your colors are absolutely adorable and your diaper cake turned out amazing. Great job! Thanks so much for sharing your party details with us! I love the rubber ducky baby shower idea! The colors are perfect and bright to use for my friend's baby shower. I plan on getting LOTS of rubber duckies to decorate. My friend does cakes, so I am going to ask her to make a rubber ducky cake to go with the theme. We are doing the party in June, so it is perfect for a summer baby shower. Thanks so much! I love it. It's so bright. looks great!!!! what a wonderful idea!! !